Exchange Online Archiving is a very useful feature for Office 365. However, very few users are actually using this feature . If you are a user of Email, chances are that you are aware of the concept of Email archiving. What it really means is that in order to ensure that our mailbox remains within the specified limit, we remove the mails from our mailbox and store the same as a backup usually in the form of a .PST file. In many cases, this process of Email Archiving is automated whereby a user specifies that any mail beyond, say, 6 months should be archived and the PST file is then stored on his PC or on the Server. 2) If the Admin makes a global search , the mails in the PST will not be searched. So compliance and e discovery suffers. 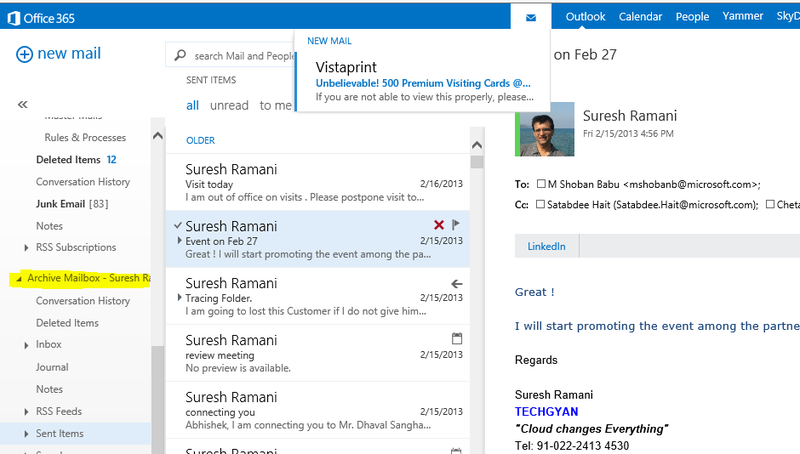 3) The data in the PST is available only from the Outlook of the user . If the user were to login on a different PC, then this data is not available. To overcome these issues and to better manage the mail backup, we can use Exchange Online Archiving. Administrators can provision it for the users. 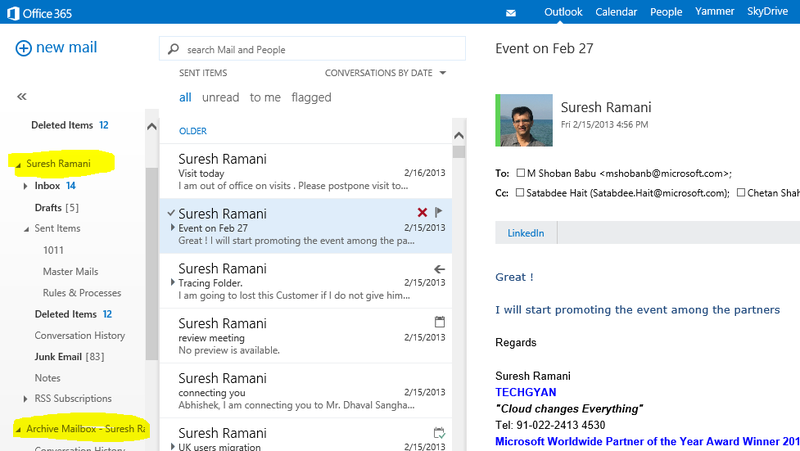 And then the users can see the Archive mailbox along with the actual mailbox in Outlook as well as in Outlook Web Access – OWA. Note that the total mailbox size remains 50 GB. It just gets divided into 2 : main mailbox and archive mailbox. 1) The PST is stored Online . So even if local hard disk fails, the PST is safe in the Microsoft Data center. As you will now understand, the Online Archive feature in Exchange Online is very powerful tool in Email Management as well as Compliance.